Off the northeastern edge of Antarctica’s Amery Ice Shelf lies Mackenzie Bay, which was painted with a ghostly blue-green mass in early February 2012. 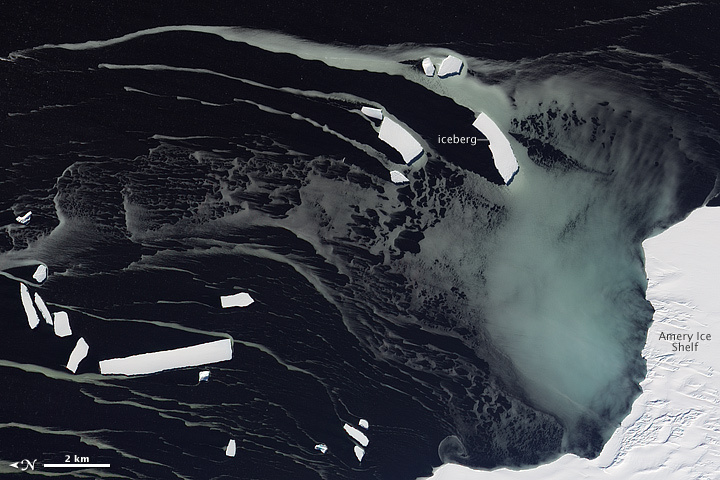 Similarly colored tendrils also streamed northward across the ocean, their flow sometimes interrupted by icebergs. Multiple factors might account for the ghostly shapes, including low-lying clouds or katabatic winds—downslope winds blowing toward the coast, which can freeze the water at the ocean surface. But an intriguing and perhaps more likely explanation involves processes occurring below the ice shelf. An ice shelf is a thick slab of ice often fed by glaciers attached to the coastline. The shelf floats on the ocean surface, with seawater circulating underneath. Like most ice shelves, the Amery is very thick in the upstream area near the shore. It thins significantly as it stretches northward away from the continent. Water at depth is subject to much greater pressure than water at the surface, and one effect of this intense pressure is that it effectively lowers the freezing point. So water circulating at depth beneath the Amery Ice Shelf may be slightly below the temperature at which it would normally begin to freeze. As some that water wells up along the underbelly of the shelf, the pressure is reduced and the water begins to freeze even though the temperature may not change. As it freezes, this deep-ocean water forms needle-like crystals known as frazil. The crystals are only 3 to 4 millimeters (0.12 to 0.16 inches) wide, but a sufficient concentration of frazil can change the appearance of the water. 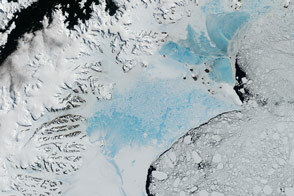 A frazil-rich plume probably accounts for the blue-green waters off the Amery Ice Shelf in the image above. Modeling of ocean circulation beneath the shelf indicates just such a plume emerging in that location. 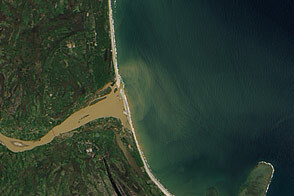 Frazil-rich water explains the plume, and wind transport of the surface water explains the long streams extending northward. 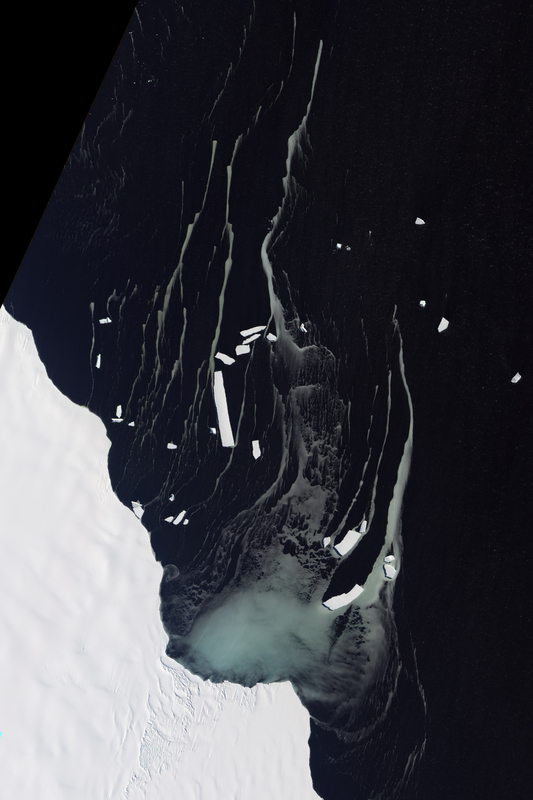 As the sub-iceshelf water mixes with surface water around the Antarctic coastline, the frazil is gradually melted and the streams disappear. 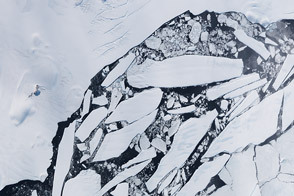 The Advanced Land Imager (ALI) on NASA’s Earth Observing-1 (EO-1) satellite captured this natural-color image of Mackenzie Bay and the ice shelf on February 12, 2012. 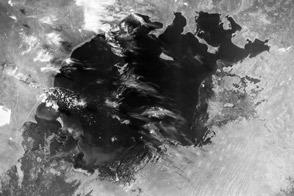 NASA Earth Observatory image created by Jesse Allen and Robert Simmon, using EO-1 ALI data provided courtesy of the NASA EO-1 team. Caption by Michon Scott with information from Helen A. Fricker, Scripps Institution of Oceanography; Robert Massom, Australian Antarctic Division; Ben Galton-Fenzi, University of Tasmania, Australia; and Florence Fetterer, Walt Meier, and Ted Scambos, National Snow and Ice Data Center. Ghostly blue-green in Antarctica’s Mackenzie Bay likely owes its existence to a complicated mix of cold temperatures and changing water pressure. All About Sea Ice. Ice formation. National Snow and Ice Data Center. Accessed February 17, 2012. Scott, M. (2009). Sea ice. Earth Observatory. Accessed February 17, 2012.